A few weeks ago, Gnip accepted to showcase its work and process to my Research Archive grad course at UC Boulder. I had contacted them months ago about my interest in their work, as a provider of social media data to various enterprises, but I never would have imagined the complexity, if not beauty, of the work they do there. On the wall of the meeting room, their mantra is written in marker: "social data has unlimited value and near limitless application." The careful interplay between value and application set the tone for our discussion, which Gnip would carefully detail for us, a willing audience comprised of students, artists, librarians, and scholars. Located in Bouder CO, Gnip is a 5 year old company that helps brands understand what people are saying about them. They work directly with publishers. 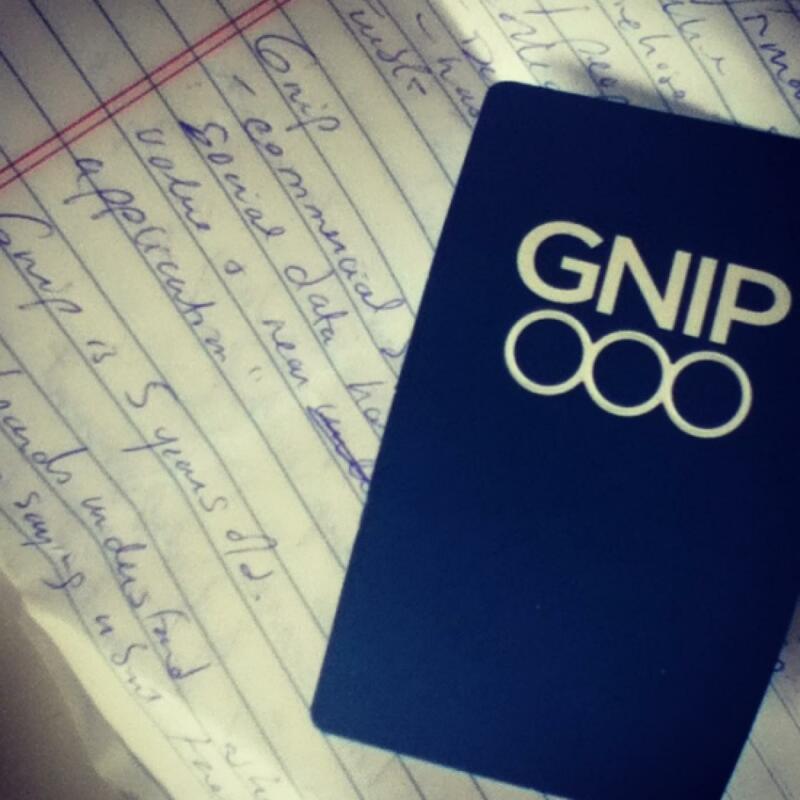 Gnip is foremost a delivery mechanism. There's something positively simple about what they deliver: data to match a brand's search criteria. But simplicity always requires tremendous design consideration, and this is what Gnip does: combining the efforts of engineers, mathematicians, programmers, marketing experts, and creative brains to develop a robust filtering system for huge and ongoing streams of social media data. For most of these brands, Gnip assures, the individual is not so important as the mass of data revealed through geo-location, clout, and central nodes that identify larger patterns useful for specific marketing ends. Gnip offers over 50 metadata fields for Tweets, including time code, unrolled links, location, retweet count, language, etc. For image-based social media like Tumblr, for example, Gnip offers a URL to the post. In terms of the Twitter fire hose, or "archive" - Gnip is responsible for recording the continuous live stream (upward of 400 million Tweets a day! ), and making it available to clients based on their search criteria, but also tracking down deleted tweets, removing personal accounts if switched from public, and so on. What Gnip offers its clients looks very much like a raw database; its legible but opens up numerous partnership opportunities for companies who want to take the data and render it more accessible, communicate important points, or use data visualization tools to effectively relay important data back to an audience.